Spring Break is almost here! If you find your family staying in town, chances are you’ll need some ideas to fill up the week with the kids out of school. Here are some local spots to check out for outdoor family fun. Aldridge Gardens – Located on 30 acres of land in Hoover, the gardens have a variety of hydrangeas, camellias and other native Alabama plants. A walking trail, lake full of fish and ducks to feed and many varieties of birds. Guests can also visit the art gallery and gift shop. Birmingham Botanical Gardens – The gardens are a fun spot for the whole family. Besides the 67 acres of gorgeous flowers and foliage, the gardens feature an art gallery and library, along with a café to grab a bite to eat. Some of the flowers in bloom during March include daffodils, pansies, Lenten Roses, tulips, native azaleas and wildflowers. Be sure to take your camera and snap some photos. 2612 Lane Park Road, Birmingham | open dawn to dusk | bbgardens.org. Birmingham Zoo – Home to nearly 700 animals from different continents, including many endangered species, the zoo sits on 122 acres just off Highway 280 in Mountain Brook. In addition to the animals, guests can ride the train and carousel and enjoy the wild slide. Daily activities include a goat walk, sea lion training and lion training. Moss Rock Preserve – This gorgeous nature spot located at The Preserve in Hoover is a hidden gem of fun. On the 349 acres are plenty of trees, waterfalls and streams and wildlife. There are plenty of boulders to climb for all skill levels and 12 miles of hiking trails. After enjoying the outdoors, there are two restaurants to enjoy within walking distance: Moss Rock Tacos and Vecchia Pizzeria & Mercato. 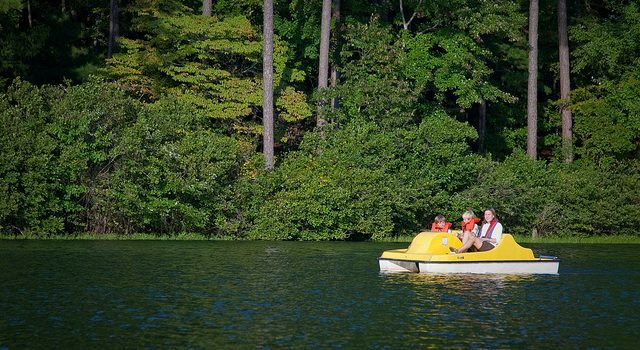 Oak Mountain State Park – The state’s largest park is located just 20 miles from downtown in Pelham. At nearly 10,000 acres, OMSP offers a variety of options including fishing, hiking, bike trails, nature programs, boat rentals, a petting zoo, basketball courts, a BMX course and more. The Alabama Wildlife Center is also inside the park, and birds can be viewed from the Tree Top Nature Trail. Railroad Park – This 19-acre greenspace in downtown Birmingham, Railroad Park provides plenty of room for kids to play, families to enjoy picnics, bike trails and two age appropriate playgrounds. Located between 14th and 18th Streets, there are plenty of trees, water and gorgeous views. There is a dining option in the park and plenty of spaces to grab food nearby. Ruffner Mountain Nature Center – Featuring 14 miles of trails for all levels RMNC is located off Interstate 20 near Irondale. Mined for iron ore for over 50 years, visitors can see historic mining sites. The nature center is open 9am-5pm Tuesday-Saturday and 1pm-5pm Sunday and features a variety of fish and turtles. Vulcan Park – The world’s largest cast iron statue is located right here in Birmingham. To get the best views of the city, take the elevator to the top of Vulcan. Guests can also visit the Museum, gift shop and enjoy the open green space. The Kiwanis Vulcan Trail provides a two-mile jogging and biking trail. If you’ve never been, or haven’t been in a long time, Spring Break is a great time to visit. With the crazy weather patterns in Alabama, the week may also include some rain. There are plenty of indoor spots around, including seeing cool cars at Barber Vintage Motorsports Museum, learning about history at the Birmingham Civil Rights Institute, checking out the exhibits at McWane Science Center, taking in paintings at the Birmingham Museum of Art, or channeling your inner pilot at the Southern Museum of Flight. There are also plenty of trampoline parks to bounce the energy out, libraries for learning and movie theaters to catch up on the latest flicks. However you decide to spend your Spring Break, make it fun and enjoy time with family!